For almost 500 years the writings of Nostradamus have fascinated the world. We have the complete FIRST EDITION of all the Nostradamus Prophecies published in 1566 known as the 1566 Edition or Edition Princeps. Until recently, this book was lost to history, yet two copies have been rediscovered. One copy is in the National Museum of Bavaria and the other is in a private collection. We use the superior 1566 Edition Princeps in our analysis of the famous Quatrains of Nostradamus. Everything you have read about Nostradamus and the Nostradamus Prophecies until you reached this site is WRONG. The true 1566 Edition is not filled with the typos and spelling errors that have been used for almost a century now by modern Nostradamus commentators that have used the inferior 1568 Benoist Rigaud edition which is a clear early pirated edition of Nostradamus. While the 1568 edition is a rare early pirated edition, with a handful of them existing that are mostly in museums. The 1566 Edition is the true complete first edition that many later pirates copied. The famous 1568 edition is an early FORGERY as FORGERY or PIRATING OF BOOKS was common in that era. There were no copyright laws to prevent printers from copying popular books. This site is also the only site in the world authorized to distribute the greatest Nostradamus translations in history. They are the SOLLOG TRANSLATIONS. Sollog is a famous modern seer that is so exact the media and his fans have dubbed him THE NEW NOSTRADAMUS. Unlike modern authors of books about Nostradamus that are not OCCULT EXPERTS, the Sollog translations are based on his unique OCCULT KNOWLEDGE that is equal to or greater than Nostradamus himself. Nostradamus even predicted that until Sollog found his real prophecies no one could understand his prophecies. Nostradamus even named where Sollog would be born. Our site is the only site in the world that is authorized to distribute for FREE the Nostradamus Movie made by Adoni Films. 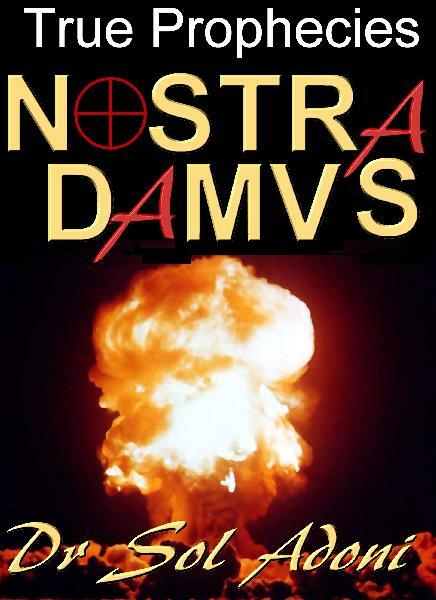 We have Nostradamus News, Nostradamus Prophecies, Nostradamus Books and Nostradamus Films. We also have a Nostradamus Forum. This is the famous Nostradamus Movie by Adoni Films.